If the soft, tender flesh and glossy purple skin of eggplants don’t appeal to you, then the veggie’s rich health benefits will! Thanks to nasunin, an antioxidant in eggplant peels that helps protect brain cells, and a host of other vitamins and minerals, this wholesome veggie is an ideal brain food. And since it’s also low in calories and carbs, eggplant makes the perfect base for a variety of delicious entrees, side dishes, and snacks. We asked healthy food bloggers for their most mouthwatering eggplant recipes, so you can start working this nutrient-dense vegetable into your diet right now! 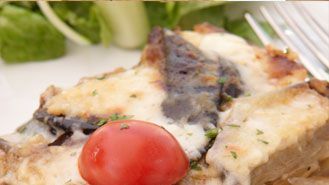 Thick, juicy slices of eggplant take the place of traditional pizza crust in this healthy recipe. If you want to cut even more calories, go light on the cheese and get creative with toppings. Slice eggplant into discs. Rub with olive oil and sprinkle with salt and pepper. Bake for 20 minutes at 400 degrees. Flip eggplants. Add tomato paste and then pile on tomatoes (draining slightly if yours are runny). Top with garlic gold, Italian seasoning, and cheese. Bake 10 minutes more. It may not be summer just yet, but this flavorful pasta is perfect all year long, especially when you want to indulge your carb cravings. Though the mouthwatering dish is on the heavier side, it includes plenty of fresh veggies (eggplant, zucchini, squash, and cherry tomatoes) and protein (chicken). You’ll walk away completely fulfilled! Lay eggplant slices on a cooling rack. Generously salt each side and let sit for 10 minutes. Blot excess moisture and salt off the top with a paper towel. Brush each side with extra-virgin olive oil and season with pepper. Spray chicken breasts with non-stick spray and season each side with grill seasoning. Cut the ends off the zucchini and yellow squash, then cut in half. 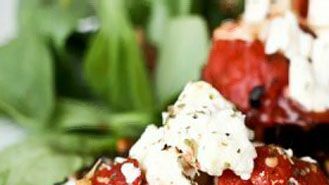 Cut into strips with a vegetable peeler or sharp knife, then add strips and tomatoes into a medium-sized bowl and toss with 2 tsp. extra-virgin olive oil and grill seasoning. Heat a grill pan to medium-high heat and generously spray with non-stick spray. Grill the chicken until cooked through, about 4 minutes per side. Grill the eggplant slices until tender, about 3 minutes per side. Grill squash, zucchini, and tomatoes together until tender, tossing every so often, about 5 minutes total. Chop chicken and eggplant into bite-sized pieces. Meanwhile add angel hair pasta to a large pot of salted boiling water, and cook according to package directions. Drain and return to the pot. Toss with 3 tbsp. Italian dressing. Divide pasta between four plates. 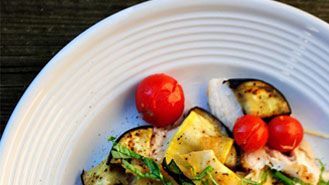 Top with grilled chicken, eggplant, zucchini, squash, and tomatoes. Drizzle each plate with the remaining Italian dressing, and sprinkle with fresh basil. 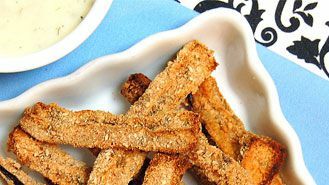 Crunchy eggplant strips coated in whole-wheat breadcrumbs taste just like fries, except without all the empty calories! Tossed in a mix of spices like paprika, cumin, and garlic powder, and accompanied by a creamy lemon dill dip, this savory baked treat is a much healthier alternative to French fries. Preheat oven to 450 degrees. Line two large baking sheets with a non-stick baking mat or parchment paper. Cut the top and bottom off of your eggplant. Cut the eggplant in half lengthwise and then into quarters. Next, cut the eggplant quarters into slices roughly 1/4 in. thick. Now cut the eggplant slices into strips roughly the size of French fries. Combine yogurt, parsley, garlic powder, paprika, ground cumin, onion powder, lemon juice, and apple cider vinegar in a large bowl. Toss eggplant fries in soy yogurt mixture, coating evenly. 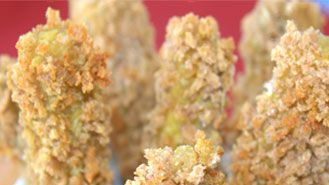 Place breadcrumbs on a plate and lightly coat eggplant fries with breadcrumbs. Spread out evenly on trays making sure they don’t touch. Bake in preheated oven for 10-15 minutes or until golden brown and crispy. Turn halfway during baking to brown evenly. Serve immediately with lemon dill dipping sauce. Combine all ingredients in a medium-sized bowl. Place in the refrigerator for a minimum of 1 hour to chill and allow flavors to combine. This classic comfort food is often high in fat and calories since the eggplant is typically dipped in bread crumbs, then fried. Coated in almond meal, garlic powder, and egg whites, this version is far more nutritious yet still brimming with crunch and flavor. Preheat oven to 350 degrees. Sprinkle eggplant slices with sea salt. Let sit for at least 20 minutes (up to 2 hours), so the eggplant releases some water. Wipe with paper towel to remove excess salt. You could probably skip this step if you’re in a rush. 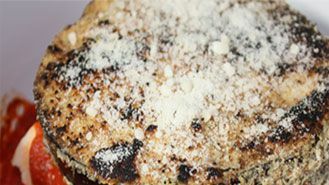 Dip eggplant in egg white and into breading of almond meal, garlic powder. and parsley. Repeat process for a 4 slices of eggplant (or 2 slices if you want to lower the fat in the recipe; in this case, you’ll only need 3 tbsp. of almond meal for 2 slices of eggplant). Using a saute pan at low to medium heat sprayed with cooking spray (don’t have it on high, or the almond meal will burn! ), brown both sides of the eggplant. Next, in a oven proof bowl or dish, place 1/4 c. pasta sauce in the bottom of each bowl. Then, place one slice of eggplant. Next, place 2 oz. of the cooked chicken. Then, top the chicken with another 1/4 c. of pasta sauce. Finally, place the second piece of eggplant on top, and top with Parmesan cheese. Place in the oven (cover each dish with tin foil) and bake for 15-20 minutes until the eggplant softens. We couldn’t resist including yet another variation on baked eggplant fries! This one, however, is infused with exotic flavor, thanks to a generous dose of curry powder. A coating of panko bread crumbs and shredded coconut is a crunchy bonus too! Peel and slice eggplant into fry-sized pieces. Preheat oven to 385 degrees. Mix bouillon cube, liquid aminos, ginger powder, and curry powder together. Set aside. Note: if your bouillon cube does not mix well, heat up the milk for a minute. Mix flour and shredded coconut together and set aside. Grease your cookie sheet with coconut oil. 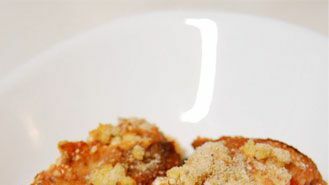 Pour out the panko crumbs on a plate. Dip eggplant into the non-dairy milk mixture. Roll it into the flour. Dip it into the non-dairy milk mixture again. Roll it into the panko bread crumbs. Place onto your cookie sheet. Bake for 20 minutes. 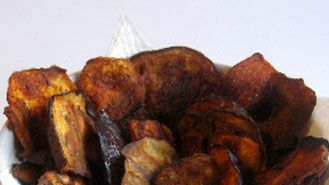 If your late-night cravings won’t let up, pass over the greasy potato chips in favor of baked eggplant crisps instead. These veggie chips get a spicy kick from a sprinkle of paprika powder, and they won’t break the calorie bank. Even better, dip them into a tahini spread for extra snacking pleasure! First prepare the eggplant by slicing it thinly and then covering each piece of sliced eggplant with a sprinkle of sea salt. Place in a bowl for 1 hour-overnight. This step helps reduce the bitterness and baking time of the eggplant. Once that time is over and your ready to cook drain out the water that would have come off the eggplant and dry each piece of eggplant. Preheat the oven to 180 degrees Celsius. In a separate bowl mix together the olive oil, paprika, turmeric, cayenne (if used) and a little bit of salt. Brush each piece of eggplant on both sides with the spice-oil mixture. Place covered eggplant pieces onto a baking tray and cook in the preheated oven for 30-40 minutes (fan-forced) or until lightly browned and crispy. Mix together the tahini, water, honey, and garlic. You may need to add a bit more water to thin it out. You want it to have a syrupy texture but not watery so adjust the water content to get your desired texture. Pour a bit of olive oil in the middle (around 1 tsp.) and sprinkle with paprika. Serve the tahini dip with the eggplant chips. Inspired by this blogger’s honeymoon to Chania, a city on the island of Crete, this dish is a kosher version of traditional moussaka, which typically includes ground lamb and Bechamel sauce. Instead, this healthier recipe calls for lean ground turkey and a plethora of veggies such as eggplant, Swiss chard, and carrots. Preheat oven to 350 degrees. Spray a rectangular baking pan with non-stick cooking spray. Set aside. Place the eggplant slices on paper towel. Sprinkle with salt. Top with paper towel, and place a pan or other weight on top. Let rest until ready to cook. The salting will draw out the bitterness from the eggplant, drawing out the salt with it. Heat olive oil in a large skillet. Add the eggplant and sauté until slices are browned on both sides. Add cooking spray as needed to keep sautéing the eggplant. Transfer the eggplant to the baking pan, forming a layer on the bottom of the pan. It’s okay if the eggplant overlaps slightly. Add the chopped Swiss chard and green peppers to the pan and sauté about 4-5 minutes. Transfer to baking dish and season with cinnamon. Spoon tomato sauce over the vegetables. Add 2 tbsp. of margarine to the pan. Add onions and garlic and sauté for 4-5 minutes until onions are translucent. Set aside in a bowl. Add the carrots and currants to the pan and sauté 3-4 minutes, until the carrots are tender. Set aside with onions. Add ground turkey to pan, breaking it up with a fork. Cook most of the way and then transfer to the baking dish, spreading the turkey evenly. Top with more sauce, followed by the onions, carrots, and currants. Press down to compact, and add more cinnamon to taste. Sprinkle with bread crumbs. Add the last tablespoon of margarine to the pan and heat until melted. Drizzle melted margarine over the breadcrumbs. Cover loosely with foil and bake for 45 minutes to 1 hour. Uncover and cook for 15 minutes longer until golden brown and bubbling around the edges. Serve with bread or rice. The good news: You only need five ingredients to whip up this creamy eggplant-based soup! The bad news: It will disappear so fast you won’t have any left over for tomorrow’s lunch. 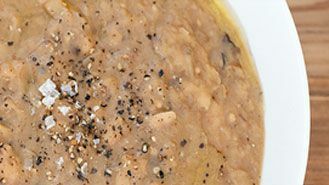 A blend of eggplant and white beans creates a chunky consistency that will leave both vegetarians and meat eaters completely satisfied! Preheat oven to its highest setting. Cut eggplant in half lengthwise and place on an oven-proof tray cut side down. Bake for 30-40 minutes or until eggplant is very soft. Meanwhile, melt butter in a large saucepan and cook onion, covered for about 15 minutes or until very soft and golden. Add beans and the liquid to the onions and bring to a simmer. Cook for about 10 minutes or until your eggplant is ready. Scrape the flesh from the cooked eggplant and add to the soup. Simmer for a minute or so, then puree if you like. Taste and season with salt, pepper, and lemon juice. This hearty whole-wheat pasta serves up one truly satisfying meal. It’s packed with vegetables, including eggplant, zucchini, summer squash, onions, and mushrooms, and bursts with intense flavor, thanks to spices like oregano and red pepper. Chop all the veggies and preheat your oven to 450 degrees. On a baking sheet (or in a casserole dish/large pan), toss the peppers, zucchini, squash, mushrooms, eggplant, and onions with olive oil, 1/2 tsp. salt, 1/2 tsp. pepper, and dried herbs. Roast until tender, about 15 minutes. Meanwhile, bring a large pot of salted water to a boil over high heat. Add the pasta and cook for about 6 minutes. Since you will be cooking the pasta a second time in the oven, you want to make sure the inside is still hard. Drain in a colander. 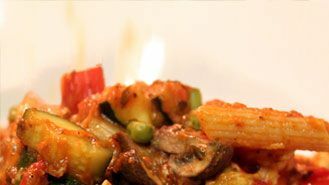 Once the veggies are done, toss the drained pasta with the roasted vegetables, marinara sauce, cheeses, peas, 1/2 tsp. salt, and 1/2 tsp. pepper. If you used a large casserole dish/pan to roast the veggies in, you can just dump all of the additional ingredients (pasta etc.) into that pan to mix everything together. Using a wooden spoon, gently mix, until all the pasta is coated with the sauce and the ingredients are combined. Top the pasta with the remaining cheese (about 1/3 c.). Bake until top is golden and cheese melts, about 25 minutes. This vegan-friendly recipe is easy to make with just a handful of common ingredients. Instead of a rich ricotta stuffing, each individual rollatini bursts with a faux tofu ricotta filling. Serve with spinach or a side salad for a satisfying low-carb meal. As a bonus, these yummy eggplant bites are almost too pretty to eat! Combine the tofu, lemon, salt, dried basil, nutritional yeast, and olive oil to make a crumbly “tofu ricotta” mixture. Spread some tomato sauce on the bottom of an 8×8 in. pan. Thinly slice the eggplant, length-wise, so each slice is about a 1/4-in. thick. Spread the eggplant slices with tomato sauce and tofu ricotta. Roll each eggplant slice and place (seam-side down if possible) in the baking dish. Top with remainder of the tomato sauce, tofu ricotta, and bread crumbs. Bake at 350 degrees for 30 minutes. Serve on a bed of steamed spinach or with a side salad. If vegan eats aren’t your thing, feel free to un-veganize with the addition of some shredded mozzarella cheese inside the eggplant rolls as well.